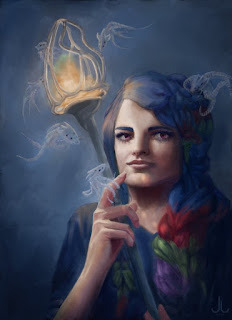 and a portrait speedpainting of a nord, the humans subspecies from the polar regions. The principle of the South is new beginnings without compromise or remorse, trying the new and unknown, and the Burners do what they can to follow that. They can be harmless enough, when they form spontaneous choirs in the streets or disturb sessions of parliament that were entirely foreseeable. But also quite bad, when they upset delicate balances, or burn down entire cities to redistribute wealth. "Burn it! Start new! What do you expect this old thing to do for you? Has it served you more than once? Can it even ever again? Burn it! Free yourself!" "Köhler" is a charcoal-burner, but it seemed so long that I went with just burners instead. They came up when I thought about what kinds of spiritual currents there would be in Genius Loci, and of course there are those who hold up one principle of the Four above all else. Potentially problematic, when that principle is "starting over, unburdened by the past". As any standing stones, nobody can say when they were erected or who did it, and if one falls, they stand up again. Vrebin in southeastern Lozir is a widely known and mighty place of power. Around a handful of tall rock spires lie some buildings and ritual places; it is particularly attuned to cleansings and whisperings, and so, many craftsmen and collectors come here to do their work. Like most, the stones stand on a power knot. The actual city Vrebin lies some distance away, but is named after the same speaker, who first established the standing stones as a ritual place. "I am going to Vrebin to become a speaker. I have long dreamt of it, as many of my family are speakers too - now I will join them. It must be wonderful to finally feel the Fifth Power." Many places of power are protected by speakers, but of only one tradition at a time. If both traditions send guardians however, they always fulfill their duties harmoniously. The wizard and mage in charge of the Vrebin stones are known to be reasonable and understanding, but still hard as nails - they will not tolerate any violation of the rules. 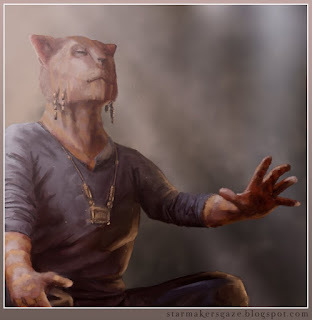 Among their duties is the keeping of the peace, but they also are caretakers of several dangerous artifacts, the mightiest being the Bloodcollar - the infamous necklace that, despite its power, is undesirable to most, because it got all its wearers killed; several times even by placespirits. "Five attempts to steal the Bloodcollar, like there's a war coming. Don't they understand how dangerous the cursed thing is? I will send listeners to smoke the raiders out." Menhirs are really cool, and I like "nobody sees how it happens" a lot, and made them erect themselves, like grass growing. When I came up with artifacts, I asked myself, where would they put the really dangerous ones? The answer is of course, you'll put it in a place where people are so powerful they can defend it against virtually anything. And so, standing stone sites are vaults for the most dangerous artifacts. "The discrepancy between the rough cliffs and the friendly citizens, the bright port and light-dappled city, the carelessness and involvement of Clom Vah is nothing short of puzzling, and amazing." 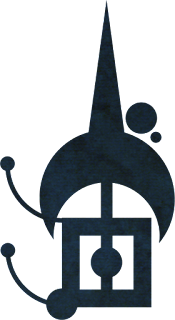 Clom Vah is the council city of Gdera. All Gderan states and peoples send emmissaries here for talk, trade, and dispute. It lies at the bend of the Mahal Bay on the east coast, atop a sheer cliff, and is built into the gigantic trees of the Great Green forest, the boroughs connected with hanging bridges, high streets, passenger birds, or even sailgliders. Its only competition in importance is mighty Gderet's capital Etnaprishta. Most famous is the Clomvahian voice hall, the largest there is, roofless and housing the sitting dryads' statues, as well as a large number of voices, and a veritable army of listeners. "There's no point in denying one's own fault, and stupidity and pride along with it. Better, and wiser, to admit, and fix, and no tears will have to be shed." The Clomvahians dress in vividly coloured chestcloth and hip-wrap, and what skin shows is bedecked with large jewelry and graphical shapes of paint. They are, as most Gderans, happy to share living space, and Clom Vah's streets are bustling with animals. Clomvahians embrace the new, are optimistic to a fault, very forthcoming, outspoken, and open-hearted. Some visitors are irritated by this, but the chance of meeting an actual Clomvahian amidst all the travellers is only one in three. 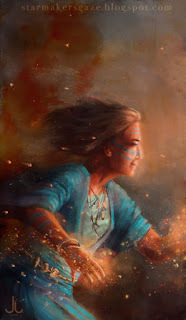 I remembered adventure novels of my childhood, describing the foreign ways of exotic peoples, and wanted some of that to be mirrored in Clom Vah's culture - almost radical, but suitable to their environment; certainly strange, but relatable; and smart, even noble, once understood. 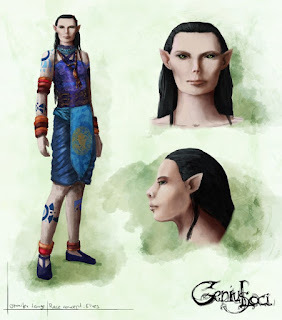 The idea for the traditional dress came from the elven race sheet. I recently developed institutions of Clom Vah which will be introduced later, like the Mage's School. Listeners are the voices' armed forces and carry out their orders. Many were voices themselves and trust them implicitly, but anyone can become a listener when approved by the voices; some join the ranks as pilgrimage or for repenting crimes and sins. Some rulers grant listeners ambassadorial status and help in their tasks, others point out that listeners, other than voices who are utterly truthful, are just regular people and might have their own agenda. The treatment of listeners has been in debate for ages. "The council doesn't care if the voices send an army of listeners! We will not agree to any search of the catacombs unless we hear it from a voice that they need to!" All listeners are skillful warriors, focusing on traditional weaponry associated with the Four, as well as experts in manners and travel. 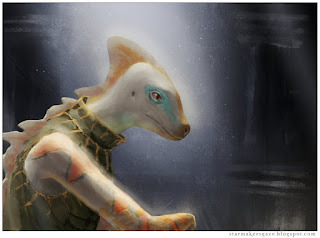 Accompanying the infirm voices is a common task, but they do much more; they seek out collectors, negotiate with elementarians, acquire artifacts... They often hire more hands for extensive tasks. "No, I have no idea why I am taking a sealed spear across half of Lozir and into the Singing Ryaq. That's what trust is for, and I trust the voices with my spirit." Stuff for legends is what listeners are. Some of the greatest heroes currently alive are in service to the voices, like Vranu Whiteblade. 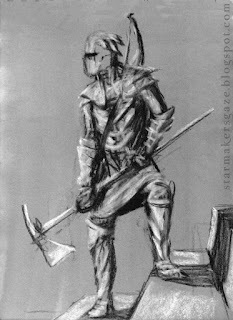 Many of the fantasy settings I enjoy, particularly computer rpgs like the Elder Scrolls, have several orders to join, and the listeners are one of those - handing out tasks of increasing difficulty to the heroes, with appropriately increasing prestige for surviving each one. The funi oldjor are creatures of legendary might. In A'ruhs, the rhu'khach language, their name means "king of honour". Funi, as they are called for short, live in the Lozirian wilderness. They are hunters, and it is said they choose one opponent whom they hunt down, to challenge them to a duel. And that there's no escape from them. The duel need not end in death, but there is a certain etiquette to follow; it's considered impossible to hunt a funi outside of a duel it chose itself, and on the few occasions it was tried, the funi created terrible devastation. The few survivors swore the funi could whisper. "Then it bowed to me. And then it came charging. I parried, I struck, I jumped aside; it bit, it kicked, it tumbled me like a ball. Finally, breathlessly, I came to stand again, but only just; it bowed again. I bowed back. Then it left. I have never come home from hunt without quarry again." A funi oldjor is as tall as a human, slender, and white with dark saddle and mouth, and has a red-tipped tail. It's said this red colour was the blood of its slain enemies when it swishes through it. 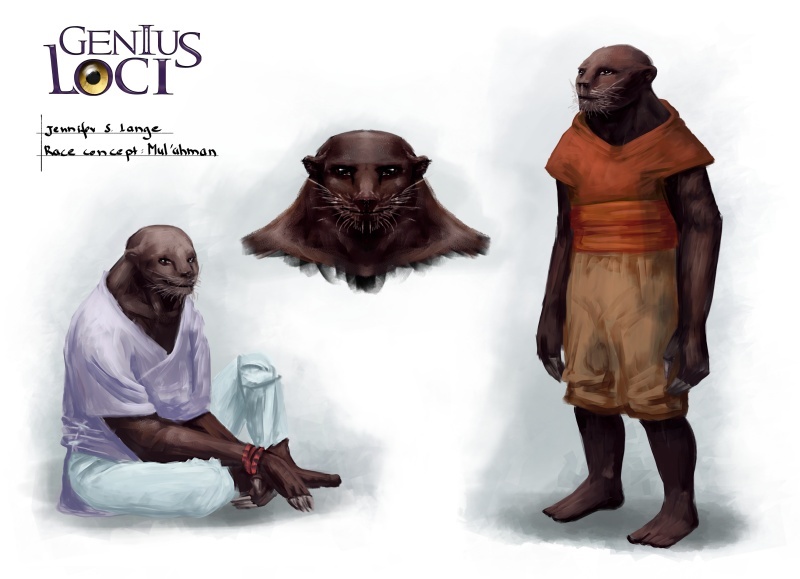 Funi have recently gained even greater renown when their rulers, Lord Giva and Lady Tchiboyé, came to human society to teach them shapeshifting. "The speakers think one of them is a human, but don't know which one. So human shapeshifters never died out after all? Or is shapeshifting a gift a beast lord gives their love?" Ah, mythological beasts, I could invent them all day. These are rooted deeply in the history of Genius Loci already, since their lords came forward to teach the lost art of shapeshifting again. And they are the first who were a couple, almost all other lords I invented are single. Except for the burrmo, who stole children. Before the beginning of Kitas, the Great Spirit gave mighty foci to the Four, and they created the world with them. 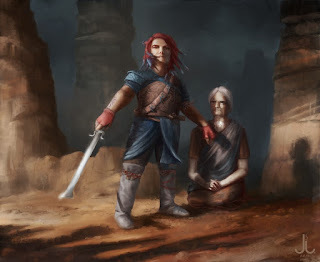 First, the Axeswinger made the unliving world, the land and air; then the Spearbearer made it move by giving the fire; then the Swordmaster brought compromise between endurance and change by adding water to unify both. Finally, the Bowarcher put living creatures into the world. When this was done, the sun rose for the first time, and the Four died, and were chosen anew by the Great Spirit among the new beings. "The Four are equally obvious and secretive, and while you will always know them when you meet, we usually know little about the Four. Where they came from, who they were; with some notable exceptions, like Lady Ghelined." How long it took them to make the world is unknown, and theories are wildly debated among scientists. 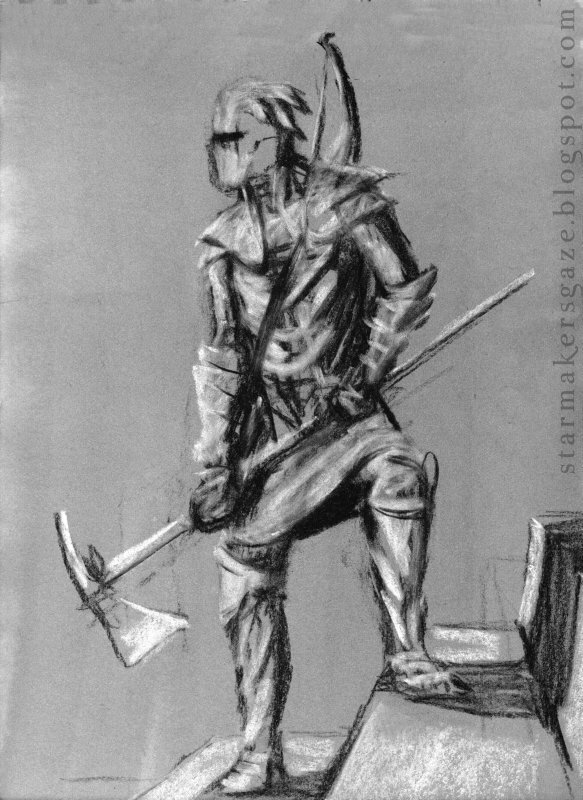 Just as unknown is the species of the First Four, but there is a traditional canon assuming the Axeswinger to be a rhu'khach, the Swordmaster a beja, the Spearbearer a raganaj, and the bowarcher an elf. Since nobody today knows the shape of a rhu'khach anymore, the Axeswinger is commonly depicted as either a tall human or a fantastic creature assembled from different sources. This is how Kitaians assume the world was made. Because the Four are the primordial beings resembling gods in Genius Loci - making them kinda important -, I come back to them time and again. Being one of The Four is a title, not a trait; they're not reborn, but new Four are chosen every cycle. Glaspia, a southern Gderan country, spent centuries pushing its border northwards. Its neighbours might have objected, if it hadn't been for the wall of Sabiré, growing in Glaspia's hinterlands for almost three millenia. During a speaker war in 3602EL, the spell relic was caused, and the wall that rose due to it didn't stop growing until two centuries ago. It is only a few hundred meters wide, but now over four thousand meters high and several hundred kilometers long. It influences local weather significantly and has created drylands on its western side. "Ah, the mages around here never let you hear the end of it. A wizard appears, and they start whispering there's going to be another wall, as soon as we cast a spell. 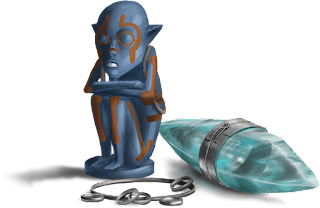 It might be interesting to the voiceless that most civilized regions were disrupted by mages' spell relics, not wizards'." As all landmarks of importance, Sabirè's Height, as the wall is also called, is inhabited by a nature spirit. Ednini is very tall, and strange. He has not been at the wall for long, but his presence has caused local plantlife to improve greatly. Unlike other spirits, Ednini speaks a lot, is easily upset, and wants company. But since most people think the wall to be cursed, scary, or uncomfortable, he has little of it and jealously guards what few people he has. "I almost pitied him, being so alone, if he hadn't been so creepy. There are almost no mid-sized spirits around the wall, only Ednini and the tiny ones in the plants he helps growing, and in some rocks. Maybe spirits, too, go mad when left alone?" This is one of those places where the things you hear about it are almost all wrong, over the top or way too harmless, and most things you can't learn at all. Nature spirits had personalities before, but with Ednini I discovered they could be influenced by supernatural affairs as well. "This was the fourth threshold we stepped through in these mountains. The map says nothing about it, so they must be new - I worry who would poke holes into the Here in six valleys." An Area threshold is where one can step over into the Area. Natural thresholds are, as many things about the Area, seemingly random - any crossing could lead into the Area, a riverbank, a door, a line between shadow and light. Artificial or drawn thresholds are easy to make, but require precision, and are best done by signmakers. Each of the four corners, then the opening, of the threshold-to-be is marked with the First Sign "Create Threshold". Because this last, fifth sign must therefore always be made into the air, and First Signs are complicated, it's hard to successfully create a threshold artificially. "That was your tenth, no, eleventh, attempt at it. I suppose we can always wait for a Nightly Traveller to happen by when you're having such trouble with that damn threshold... I'm just joking!" Because Genius Loci is also built as a roleplaying world, sometimes I think in terms of difficulties for dice rolls. But imagining how it actually looks is exciting; making a threshold should be mysterious and strange. Most travellers know how to make one, even if not all are good at it. 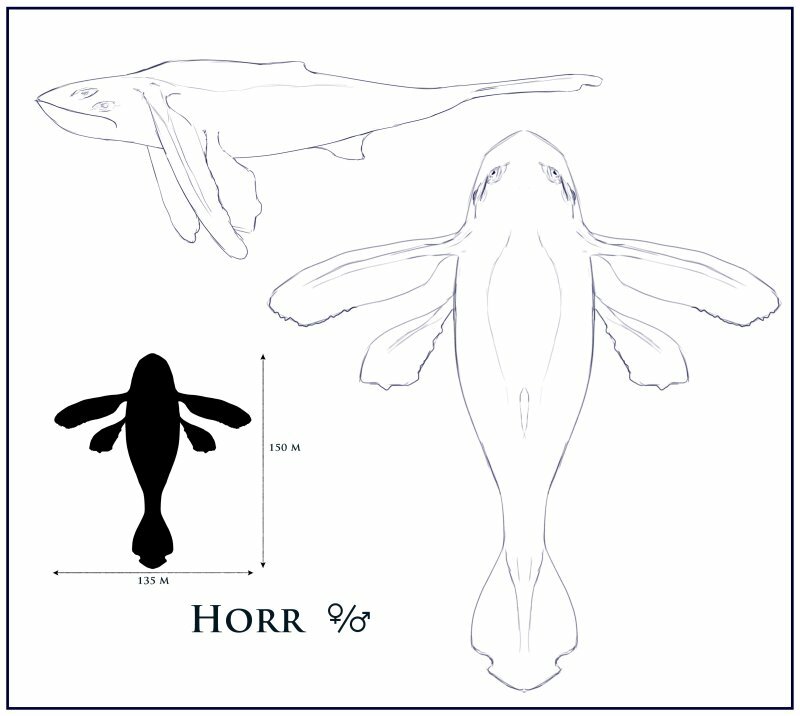 Horr aren't normally mentioned in singular, because there seem to be no individual swimmers among them. 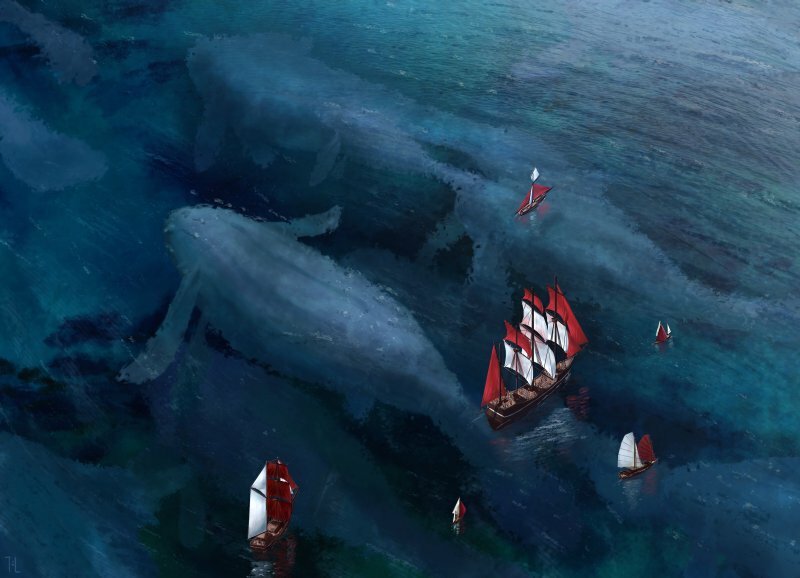 The gigantic sea beasts instead only appear as swarms, or more specifically, as one swarm, so large it would emcompass an entire continent if they swam in a line. A horr is far over a hundred meters long, has four flippers and four eyes and thus is able to see below and above him. They are dark greyish blue in colour, with a dull red stripe on the side. "That was a day to remember, when the horr pushed themselves into the fleet parade and dwarfed the ships that had seemed majestic and huge moments before. They are given their own holiday now, and seem to greatly enjoy the attention; they even take a small detour to come by our coast." The horr swarm is not very well researched. 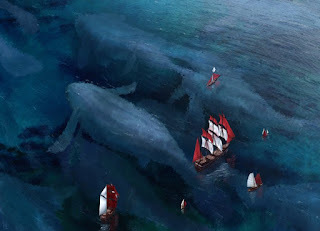 Their enormous size makes it difficult to get close; while horr are quite gentle creatures, they go about their business trusting that smaller things (like ships) will make way. 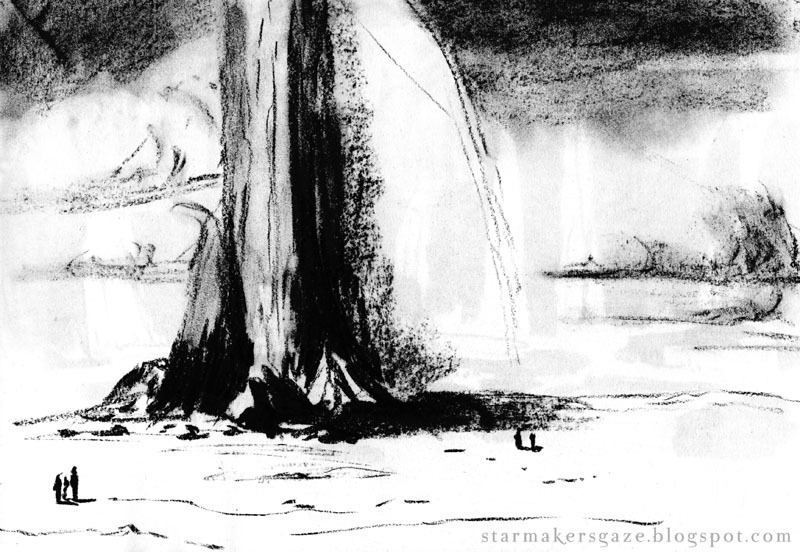 They seem to like the Summerstar Isles in southeast Ryaq, and are said to know paths between oceans not known to mankind. Horr are not hunted. Aside from the incredible effort it takes, the last time a horr was killed in Lozir, the swarm stayed away for a Great Quarter and with it, most other sealife as well. Whales have always held great fascination for me, and never cease to amaze me with their intelligence and integrity. Horr are my chance of mystery on top of it. 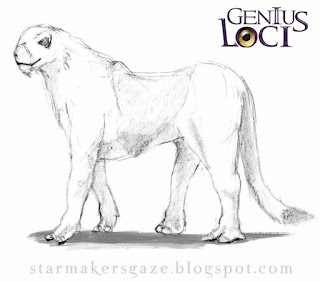 Because they're so difficult to travel and opportunities so different, many fantasy worlds leave out great parts of the sea, but I intend to give Genius Loci a lot of ocean adventures as well. 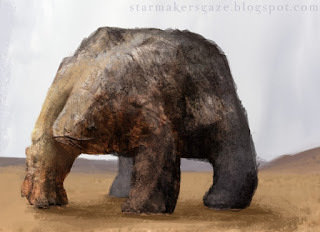 The mul'ahman, or diggers, are a species that is very quiet and barely ever noticed, and they're fine with that. A mul'ahman is a stocky person averaging 1,50m in height, covered in dark brown to black, velvety fur with small eyes and lots of white whiskers. Their shoulders and arms are very muscular, their clumsy fingers make shovels, and indeed diggers do dig surprisingly fast. Not being too good with colours, their clothes come in trademark earthen tones. "They are gentle, well-mannered, peaceful, and value musical instruments over weapons. We wish we could convince more to come to us as sappeurs; still, Mul'geranan is probably our best neighbour. Sadly, it is also our shortest border." The diggers' most known settlement is the state Mul'geranan in southern Sawa, where the underground dwellers live undisturbed; unlike other species, they show little interest in other folk. Because of their small numbers, they are left to their own devices, but enjoy company when given the chance. "It has long been discussed if we should invite above-grounders to live with us, but we fear our love of slowness might be to our disadvantage, and so we keep discussing. Slowly." These guys are just so nice. I don't even have anything planned for them yet. One might think such a calm people among all the rowdy neighbours of Brighthold would be in constant danger, but because of their peacefulness, Brighthold keeps them safe. I considered throwing them out several times, because they're so literally anthropomorphic, but I looked around my species and let it slide. 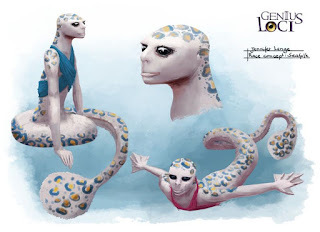 Now, this is probably really the last species in Genius Loci, although I won't promise there aren't any living in the far mountains or the deep south or wherever. More art published on deviantArt: Curses, also described in a blog article, Starmaker - the avatar of the Area - and the city of Agorisai, that recently had its blog article published. "Seriously, there's only two species in your village? Odd." 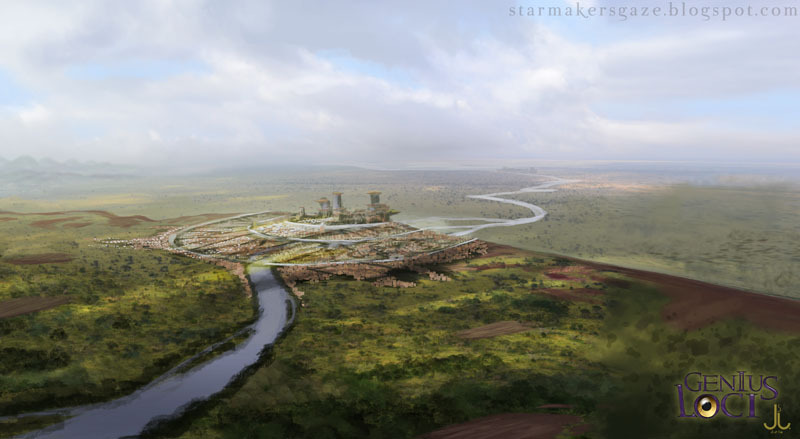 Gamahan is Sawa's council city, and as such invites emissaries from all lands and tribes for talk and trade. Like all three council cities it's an own state, and may be the oldest city in the world; legend tells it stands where the spearbearer put down the spear Lefenned for the first time after the making of the world. 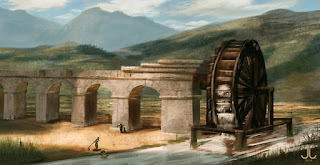 The architecture is rich and diverse, and filled with primeval mechanics that are taken care of by the engineers from the neighbouring state Lebridge. Gamahan spreads over a cliff, with two thirds up above, and the rest down in the plains. Gamahan means "circled land" in the old language Sorit, and the four city walls are perfect circles, spreading flawlessly over the cliffs. Each of the four boroughs is dedicated to one element and shows it proudly, with the western quarter (the Forest or Green Borough) being practically a forest, while craftsmen flock in the eastern quarter (the Earthen or Yellow Borough). The city's center is the Plaza of the Heavens, a gigantic open space surrounded by the world's supposedly most ancient structures, among them the famous Magician's School. Gamahan is infamous for its predatory paperwork - travellers may find themselves dutiable citizens sooner that they think. "I'm supposed to pay taxes for what now?" Most places have a traditional costume, but Gamahanians dress eclectically, only striving for a simple elegance. Common clothes are straight trousers and short-sleeved pullover shirt. In the third circle, nobody wears a hat; otherwise, clothes are combined freely. 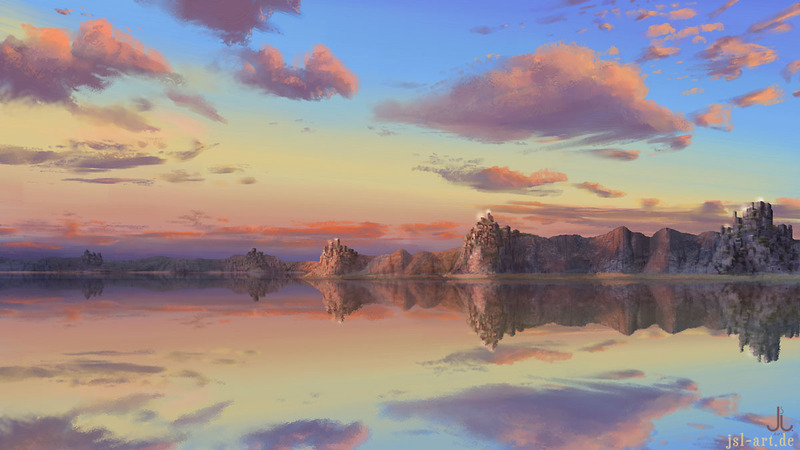 I don't dare call the image a matte painting, but it's drawn over a photo. I use this technique for concepts sometimes. Support Genius Loci on Patreon! Any support will be greatly appreciated! There are rewards to be had for your pledges, like cheap commissions or in-depth looks into my work. 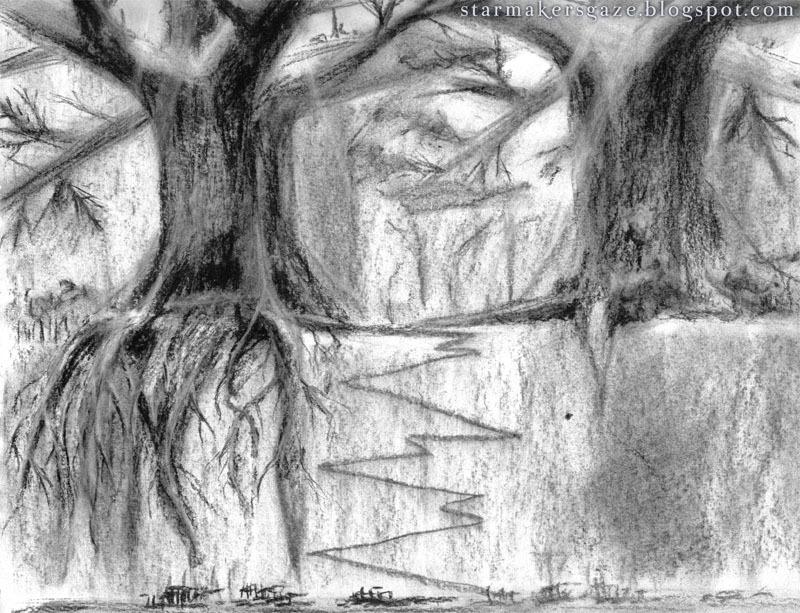 Two new artworks are now published on deviantArt with new quotes: A concept of the gubra, and a caravan trekking through the mid-level of the Great Green forest. Both have their own articles in the blog as well, which the gubras share with their Lord Gahatenge, while the forest has more room to itself. "If you think the Star Sea is littered with treasure islands, you really have no idea what it looks like under the surface. Let me show you." Seafolk live in the seas, of course, preferring saltwater, but they live in brackwater as well. 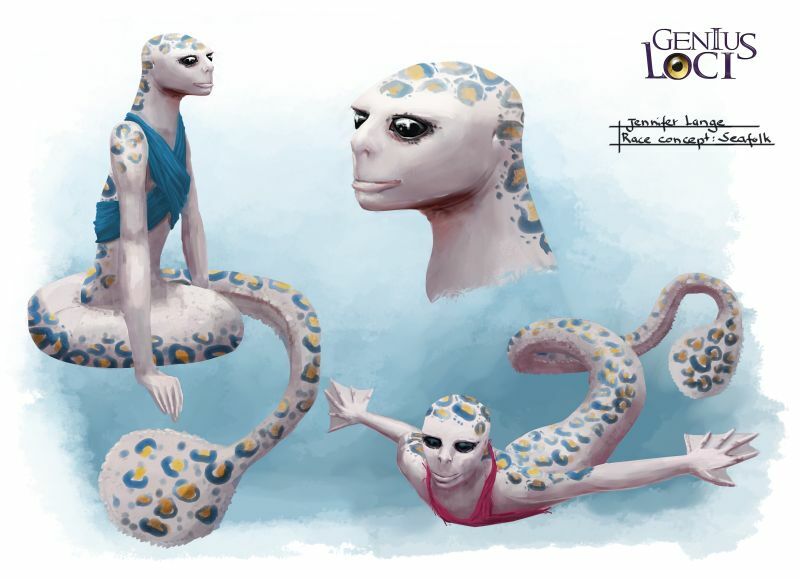 They are humanoid, but with an long, sluglike tail instead of legs. Seafolk have a skin pattern of filled irregular dots, six webbed fingers, and large black eyes. 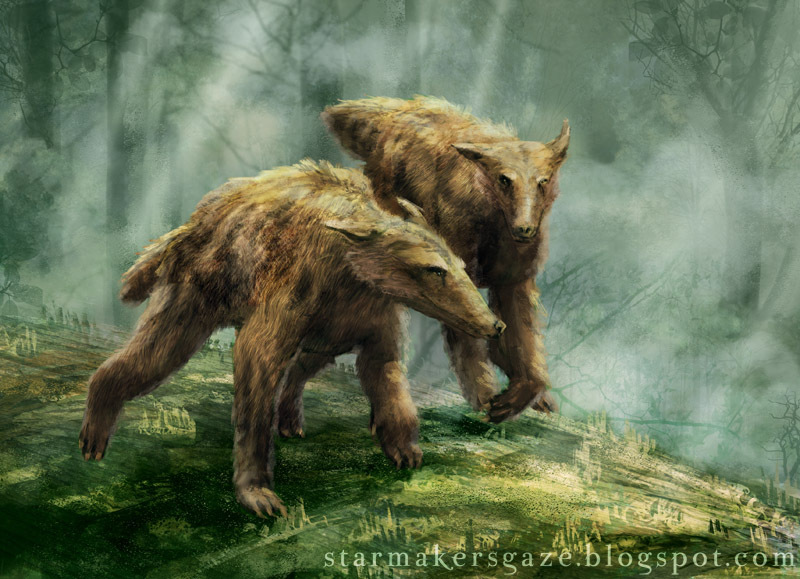 They don't have to breathe air, are weak but agile, and have good senses. "Some had been worried after the construction of the canals, how the seafolk would fit in. But the children, of course, used the basins and flooded steps to be jolly with the seafolk kids, and when they grew up, seafolk seemed quite normal." Seafolk live with the other species where they can, as normal members of society. 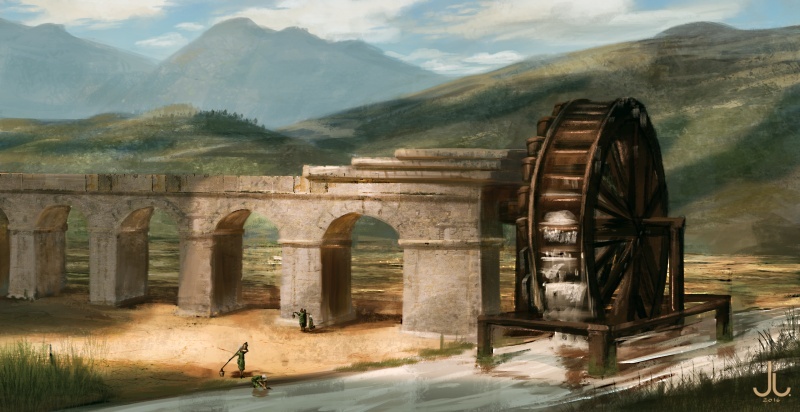 While being limited to saltwater, architecture often accomodates for them with tiny canals or stacked basins, and some rich cities even built waterfilled tunnels and elevators for them, like the Greater Talash-Kehs capital, Mourinor. Off the coasts, the seafolk harvest the treasures of the seas; they farm algae and clams and herd fish, they act as pilots for ships, and as midwifes for garren - who have certain ideas about their eggs - and of course they find pearls and corals. Famous products are the clam soap made from fat clams, and algae silk. Of course there are mermaids in my setting. They're just not the tradiotic vixens luring seafarers to their death, they're people. I most enjoy the idea of cities with tunnels and canals and fountains so seafolk can be about with everyone else. I wonder what their relationship with the fleeters may be, as those prefer freshwater and the seafolk lives in the oceans.